Whey protein is an indispensable part of modern bodybuilding workouts. Some fitness trainers refer supplementation as the pillar of staunch bodybuilding. With new health and sports supplements coming out on shelves every other day, it has become quite a challenge to pick what is best for you. There is a plethora of fitness activities, sports, and goals which require a totally different set of diet and supplements to follow. The major ingredient to get you the results whether you are trying to gain weight or lose fat is Protein. Protein as a supplement could be derived from various sources including plants like soy and pea, or dairy products like Whey and Casein. Whey Protein is the king in the kingdom of bodybuilding supplements as it provides with plenty of protein for new muscle synthesis and muscle recovery. Whey Protein is a byproduct which is obtained during the curdling of milk to form cheese or other milk solids, especially the milk of ruminants. Whey Protein Concentrate (WPC): It is obtained by putting Whey under ultrafiltration and diafiltrating process. This might contain a notable amount of nutrients other than protein including fats and lactose. It is also the slowest digesting Whey Protein. 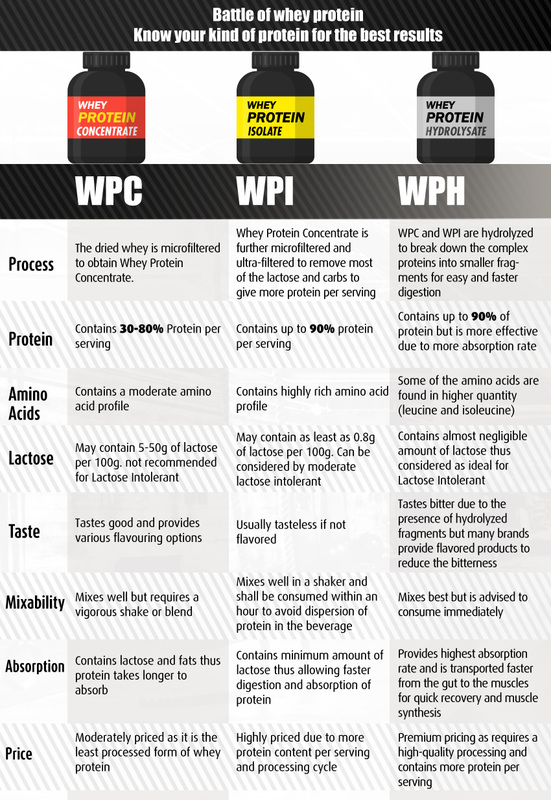 Whey Protein Isolate (WPI): When WPC is further purified to remove nutrients other than protein, we get WPI. It is purer than WPC and provides more dose of protein per serving. It is approx. 90% protein by weight. Whey Protein Hydrolysate (WPH): It is obtained when WPI is further hydrolyzed to simply the complex amino acid chains into simpler ones. This form of whey protein is easier to digest and is transported from gut to muscles quicker than the other two forms of Whey Protein. Though this might taste bitter, it is an indication of availability of pure protein in each serving. Every goal needs a different set of nutrition and you don?t need to burn a hole in your pocket every time. Know your protein better and keep rocking with your goals! Give a quick but careful look to the following table to know what you need. Now that you know what are three main types of Whey Proteins composed of, you can pick only the one that will help you achieve your goals without making your pockets lighter.